Roman Augsburg and Kempten are hidden gems of Southern Germany. This region offers more than skiing holidays and Oktoberfest, nice though they are. Traces of ancient Celtic and Roman settlements in the former Province of Raetia can still be made out, while during the Mediaeval and Early Modern Period the Imperial Free Cities, bishoprics and monastic foundations acted as seats of learning and industry. This is the first part of a mini-series dedicated to “hidden gems” in Bavaria: Whilst Part I looks at two Roman Foundations and their early modern afterlife, Part II will discuss a number of small museums far from the bright lights of Munich but in their ways no less interesting than the attractions in the Landeshauptstadt. 70 years ago, on 25 February 1944, the city of Augsburg, Roman Foundation, Free Imperial City and one of the foremost cities of the German Renaissance was severely damaged by allied bombing. Rarely mentioned, the destruction was fierce and fire fighting was difficult during a particularly cold winter. Visiting Augsburg, it is sometimes difficult to imagine the city of the sixteenth century when the riches of the Fugger and Welser, their collections, gardens and townhouses made this a particularly attractive as well as politically important place. Held at the location of Imperial Diets and treaties, the Peace of Augsburg (1555) guaranteed essential rights to religious minorities – certainly not to all and not completely but the Confessio Augustana was an important regulatory achievement for Catholics and Lutherans living within the Holy Roman Empire. 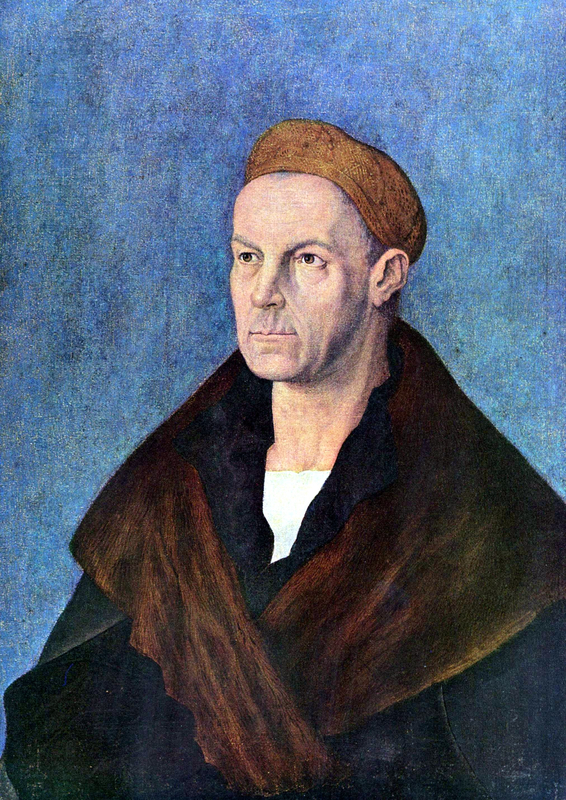 The Fugger were wealthy bankers, not unlike the Medici of Florence. They were raised into the nobility for their services to Emperor Charles V Habsburg who had had to borrow tonnes of gold to bribe the electoral college in 1519. They were also collectors of antiquities as well as plants, sponsored some of the most important artists of the time, for example Jacob Fugger the Rich was portrayed by Albrecht Dürer (ca. 1519, Staatsgalerie Altdeutsche Meister [Augsburg]. In 1521 the family was not only going to build the famous Fuggerei, an enterprise of social housing older and more attractive than most and in use to this day, the Fugger also commissioned accommodation for the living as well as for the dead members of the family in the then new Renaissance style: the Fuggerhäuser’s Damenhof in 1515 (destroyed in WW II and rebuilt in the 1950s) and the burial chapel at St. Anne’s Church which was founded in 1509. Augsburg’s ancient past was a matter of great pride in early modern times. Founded by the adoptive sons of Emperor Augustus, Tiberius and Drusus, under the name of Augusta Vindelicorum in 15 BCE the new centre rose to be the capital of the Roman Province of Raetia. The Augustusbrunnen was created by a local artisan according to the plans of the Flemish artist Hubert Gerhard between 1588 and 1594. It bears inscriptions referring to Augustus and to Emperor Rudolph Habsburg during whose reign the fountain was placed in front of the Gothic Augsburg town hall (re-built by Elias Holl, 1615-1620). In the historic city centre, Augsburg’s archaeological Roman Museum began in 1822 as the Antiquarium Romanum and hosts an exhibition of Roman remains at the former Dominican church of St. Magdalena (1515), whilst the city’s archaeological services explore Augsburg’s Pre-historic as well as Mediaeval past at several excavation sites (for more information, only in German, visit: http://www.kunstsammlungen-museen.augsburg.de/index.php?id=19791). A considerable portion of the exhibitions at the Augsburg Roman Museum is closed to the public for renovation for the next few years, so interested persons and scholars should contact the museum before visiting. Although most are not on public display but are a great resource for scholars, Augsburg has Germany’s third largest collection of Roman provincial artifacts, many of especially high quality and carefully conserved. 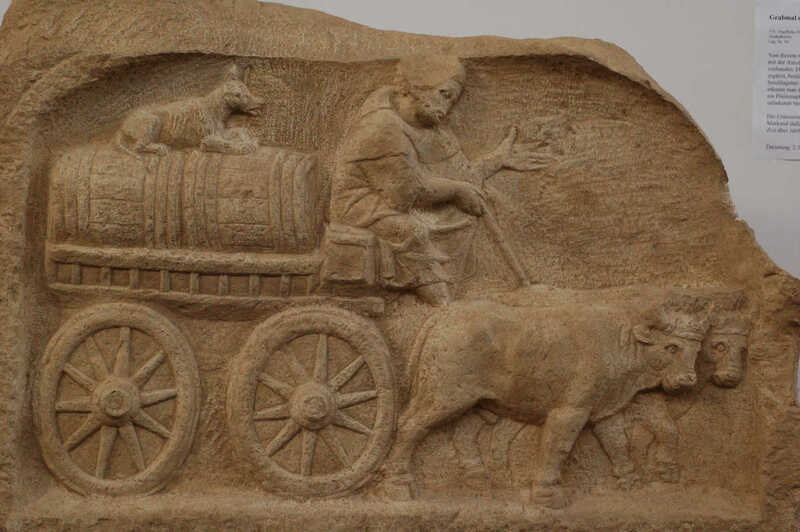 Note the main feature photo above opening this brief article with the Roman grave stele relief of a man-driven oxcart with a wine trade barrel carried , on top of which a dog sits. 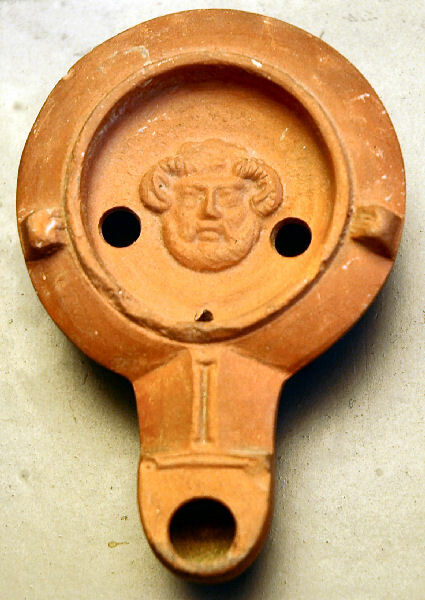 The Roman wine trade was a vocal part of supplying Roman legions with the daily ration of wine, generally white wine. Some of this wine was grown to the north along the Mosel River northwest of Trier (Augusta Treverorum), a wine region praised by Ausonius in the 4th c. in his poem Mosella. It may not be very easy to detect Roman material culture in modern Augsburg, unless one is interested in the early modern reception of Classical culture. On the other hand, the Augsburg Roman Museum is rich in history. 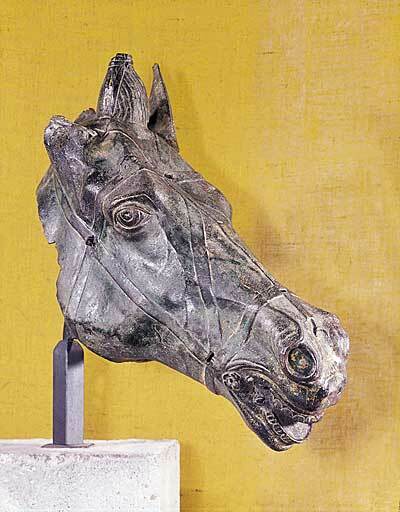 Roman artifacts there worth seeing during a visit include a famous bronze horse bust front he 2nd c CE, grave stele with reliefs like the wine cart above, inscriptions, a victory altar, sarcophagi, coins, glass and materials of farming life. Kempten, the former Cambodunum is a different matter. Possibly mentioned in Strabon’s Geography in 50 BCE, it may even be the oldest “city” in Germany although the Roman settlement post-dates the conquests of Tiberius and Drusus in 15 BCE. The descriptive –dunum is a Celtic word reference to an old indigenous Pre-Roman fortress or oppidum town. There may have been some rivalry between Cambodunum and Augusta Vindelicorum to start with; it seems that Kempten became the provincial capital of Raetia before Augsburg. Note the remains of Roman forum remains at Cambodunum at left, part of Kempten’s Archaeological park, with its reconstructed Gallo-Roman temple, typical with its square shape and second level. Roman Kempten boasted several temples, baths and a forum; like any such foundation it offered the comforts and luxuries of a Roman plant-city. Ancient remains were discovered in the nineteenth as well as the twentieth century and today this archaeological park that opened in 1983 displays the remains and reconstructions of such temples as well as a thermae complex to visitors. Kempten is well worth a visit to understand the Roman in the region. For information dedicated to the Forum of Cambodunum there is material at the park (for more detailed information in German and images please visit http://www.kempten.de/de/archaeologischer-park-cambodunum-apc-1.php). During the summer months, the archaeological park becomes the location for cultural events, including concerts, theatre performances and Roman fashion parades. 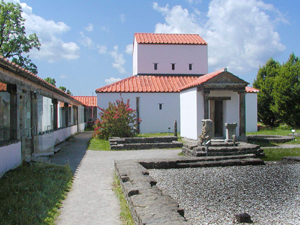 The Roman Museum in Kempten also houses artifacts such as milestones, amphorae, mosaics and deity images. Like Augsburg and many other former Roman city of Italy, Kempten eventually converted to Christianity. Around the year 700 an Abbey was constructed―one of the earliest monastic foundations of the area. When the city became one of the Free Imperial Cities, the Duke-Abbots of Kempten started to lose their property rights in town. With the Reformation Kempten turned Protestant in opposition to the Catholic Abbey whose new St. Lorenz Basilica and princely residence was rebuilt in Baroque style after the Thirty Years’ War in the 1650s. The diverse incarnations of Kempten, from Antiquity to modern times, nestling at the foot of the Alps can be discovered via the Kempten Museums trail (visit: http://www.kempten.de/en/media/L.a.Ke_english1.pdf) which offers insights into the Roman Foundation as well as in the monastic culture and princely splendour displayed at the Abbey. 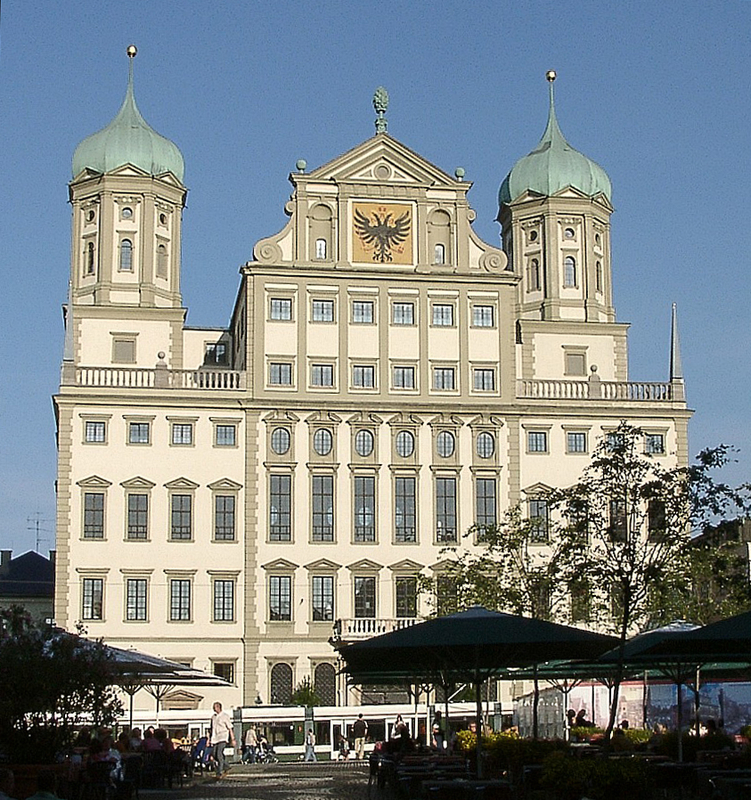 The histories of Augsburg and Kempten have been intertwined since Classical Antiquity. During mediaeval times the Bishop of Augsburg, St. Ulrich, was also abbot of Kempten. Nowadays both cities are well-connected by train to Munich, Ulm, Füssen and Kaufbeuren. They are well worth a visit but be aware that springs tends to be cold and wet, while the heat of summer when it finally arrives makes the local beer gardens very attractive indeed.